What do you give the ring bearer? In the past you gave him a pocket knife to whittle a stick of wood. Today, things are different. 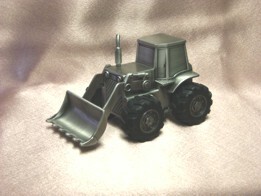 We have come up with some great gifts for the ring bearer - piggy banks with play appeal. 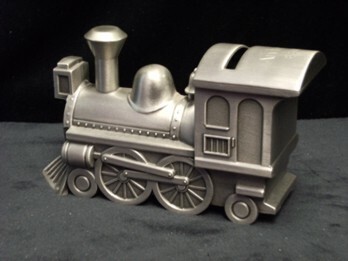 Pewter finish, like an old steam engine. 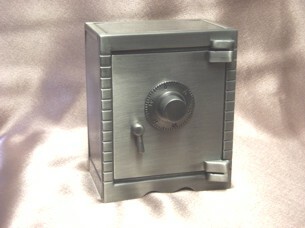 We engrave the top by the coin slot. First name and wedding date ENGRAVED FREE. 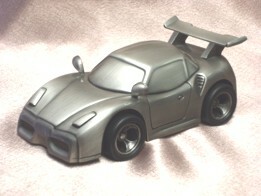 Pewter finish with wheels that turn. This gives playability while teaching the ring bearer the chance to learn about savings. We suggest putting a couple of quarters in to catch his interest. First name and wedding date ENGRAVED FREE. Pewter finish. The dial actually works. Instructions included.High playability even with adults. First name and wedding date ENGRAVED FREE. Pewter finish. Working wheels and blade. 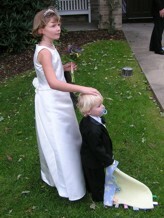 Great playability plus the ring bearer learns about saving money. A great give for a young man. Pewter finish. Sail turns from side to side. 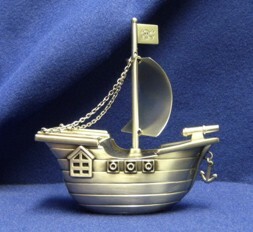 If your ring bearer loves pirates, he'll love this bank. Room for name and date to be engraved. Imagine the eyes pop out when he opens up his gift. You get to show him how it works and let him play. We engrave his name and wedding date on the side. He will remember your wedding for years to come by this special gift. 2" dia. Silverplated.